One of the more serious problems that can occur during pregnancy, labor and delivery is placental abruption, which occurs in about 1 out of every 200 deliveries. This is an obstetric emergency where the placenta separates from the lining of the uterus, depriving the baby of oxygen and nutrients, and potentially causing severe bleeding that can be dangerous to the mother and child. The separation can be minimal or it can be a complete separation. In either case, an emergency C-section is typically performed in order to minimize the risks of birth asphyxia and other birth injuries to the baby, because abruption can progress to very severe in a very short timeframe. Who Is at Risk for Placental Abruption? How Do Doctors Diagnose Placental Abruption? Blood loss, uterine contractions and fetal distress are the first signs of a potential placental abruption. In cases where placental abruption is suspected, the fetal heart rate will be monitored very carefully. If fetal heart tones are non-reassuring, doctors immediately perform an emergency C-section. Doctors also order an ultrasound and exam to rule out other causes of bleeding. What Happens When a Placental Abruption Is Diagnosed? If the abruption is minor and the baby is premature (before 34 weeks of pregnancy), then delivery may be delayed as long as the mother and baby are doing well and the bleeding is under control. Because there is always the risk that a minor abruption could worsen, the doctors must weigh the risks of prematurity against the danger of the abruption worsening. If the baby is nearly full term (after 34 weeks of pregnancy) or if the abruption occurs during labor, an emergency C-section should be done immediately (even if it’s minor) because of the risk that the placenta could separate further at any time. What Can Happen if a Placental Abruption is Not Appropriately Diagnosed and Treated? If a placental abruption is not appropriately treated both the mother and the baby are at risk. What Can You Do if You Suspect Your Child’s Condition Is Due to Improper Handling of a Placental Abruption? The first step is to get sound legal advice. A qualified attorney can review your medical records and determine if doctors, nurses and other medical staff were negligent in treating your placental abruption. At Reiter & Walsh ABC Law Centers, we work with premiere neurologists, neuroradiologists, obstetricians, labor nurses, child development specialists, therapists, life care planners and more to help determine if a child’s birth injury could have been avoided. We will help you get answers and the compensation your child needs. 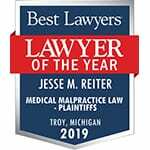 Contact Reiter & Walsh ABC Law Centers today.